Useful knitting accessories in the SOS knitters toolbox – The SOS knitters toolbox shouldn´t be missing in any project bag, it contains everything you need for knitting. On your way to a knitters meeting or simply knitting on the road … which tools do you need? At home baskets, drawers, bags etc. are well filled with all the tools you need, but on the way? 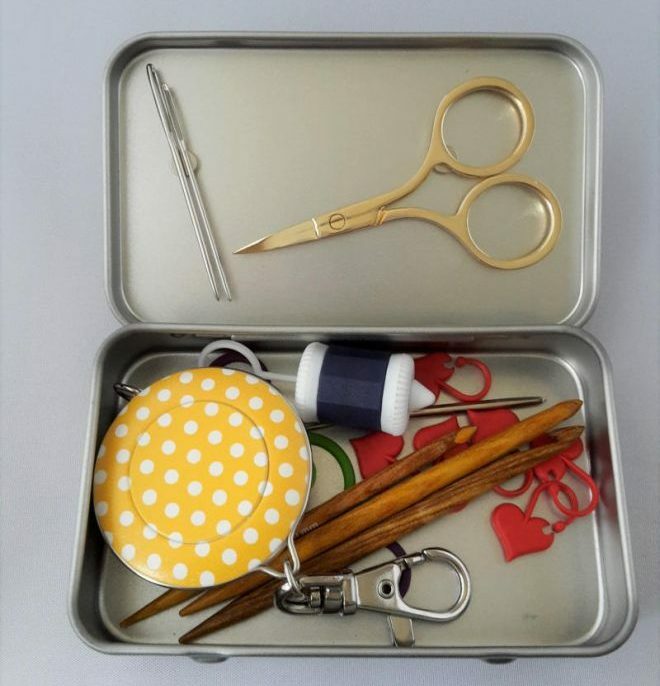 The SOS knitters toolbox contains everything a knitter will need. The knitted accessories are packaged in a noble tin made of tinplate, which can be stowed by its small size wonderfully in every handbag or in every project bag. The scissors and the needles are also stowed with super-strong magnets in the tin cover so that they do not interfere with the search for the correct stitch marker or the like. They are also always ready to hand. However, the magnets are not attached, so you can decide whether to fix them with an adhesive or to remove them altogether. All knitting accessories will find their place in the SOS Knitting Toolbox also without magnets. I myself like it, however, when I have stowed the needles and the scissors in the cover. I use my SOS Knitting Toolbox not only out of the house, but also when I knit at home. I sometimes wander with my knitwear from the living room couch to the living room table, my desk, the kitchen (yes, I knit while I’m cooking) or in one of the children ’s rooms. If you need less knitting accessories, you can also get the SOS Knitting Toolbox „light“, which does not include a repair hook and a roll-measuring tape. And if you have just fallen in love with the great tin, you can of course only buy the SOS Knitting Toolbox „pure“ and then equip it yourself. In the future, I plan to add some more variations, like the SOS Knitting Toolbox „carefree“. But be surprised! You can get the SOS Knitting Toolbox from now on in my Shop ! With the SOS Knitting Toolbox you always have everything ready to hand!